Good. Great. Elite. Three words that can describe the effort or work performance of an individual or team. The definitions may vary by person but in any industry, company, or role, these three words can rank an individual or team by their capabilities, accomplishments, and work ethic. 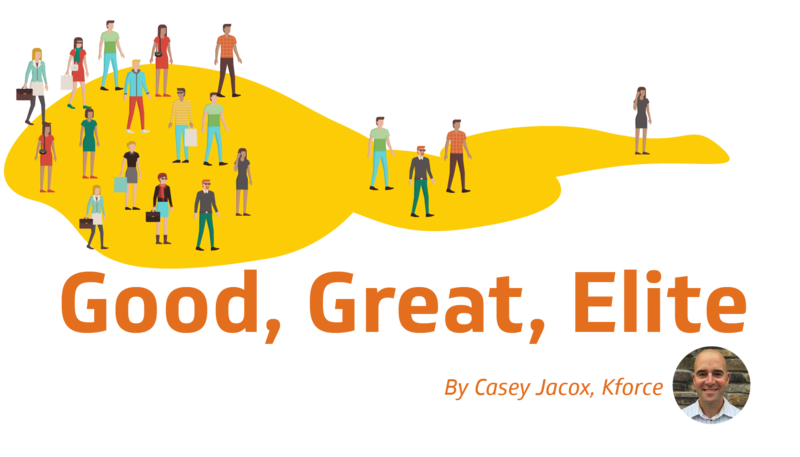 “Good” people are not in your top 30-40 percent, but you can count on these people. They may require additional coaching. These individuals sometimes make excuses and have a difficult time showing vulnerability in taking a step toward improving their skillsets. They don’t necessarily hurt you or the organization but don’t help motivate those around them. In my current role as President of Client Strategy and Partnerships, I was selected to be on a team to help lead an immense sales transformation effort that would alter the way our sales teams go to market with our branded message. I found it very beneficial to look at myself as well as those around me to see which work performance category each person fell into. It provided me with a great way to coach and motivate others toward achieving short and long term goals in the workplace.